I'm working on a website. In one of my forms I need to select the form type (depending on the form type the rest of the fields will change their behavior, e.g. the disabled status and their placeholders). There are only two available types: "type A" and "type B". I am wondering what the best practice/rule of thumb is in this case. This is a good option since I could add additional types in the future; however, it doesn't look so nice. This option also allows me to add additional types in the future, but it occupies more than one line (of my form) which I don't like (all the rest of the form fields occupies single lines). This option is a checkbox (behind the scenes); therefore I can toggle between only two options. However UI-wise it looks great. P.S I'm using material design in my site so material components can be a valid solution (however, the question isn't directly related to it). The drop down has a disadvantage compared with the radio-buttons and the slider-toggle. The user has to click on it to see the possible options. On mobile (if this is the case) drop downs are not easy to use. I agree with Owen Hughes about the toggle. In this case, I would go with the radio buttons. But there is an alternative: You could use a segmented control. But with only two options, segmented controls can be confusing, because it might not be clear which segment is selected. So be careful with the design. It also would be easy to add more items if necessary. Since the segments in the segmented control feel like a button, the user can expect that an action is performed. This way the change of the forms is not unexpected like they would probably be when using a dropdown or radio buttons. If you want the user to select 1 option of a range, I would be inclined to go with the radio button as this is the convention. This would be my go to. However if there is a change in the form under it then a drop down wouldn't be a bad idea either as the interaction is showing the change as a result of the drop down item being changed. As for the toggle, toggles for the most part indicate an on/off type interaction so I dont think this is the right thing for what you're describing as the form changes behaviour as apposed to something becoming active/inactive. 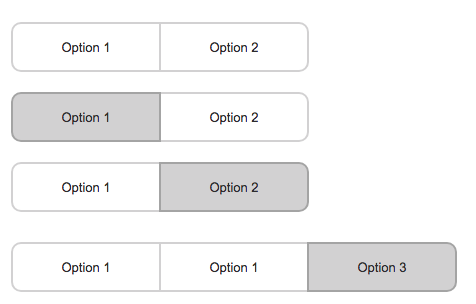 The radio button and drop down may not look pretty but its selecting the right form element to suit the interaction you want the user to do using elements that are the common standard in forms. When you think about both the radio buttons and the select tag, they both to the exact same thing but in different ways. They both allow you to select one item from x options. My personal rule of thumbs is: if I need more than 4 options, use a dropdown to keep my form clean, if I have less than 4, use radio buttons so that my user can see all the options at once and make his choice with a single click. Of the 3 options you've offered, radio buttons make the most sense to me in the case you've described (with only 2 options). The advantage they have over a dropdown is that all the values are immediately visible, and, in your case, it doesn't look like they would need to occupy 2 lines - you could just arrange them horizontally. The slider toggle option as described, IMO, is the least appropriate. This type of control is also referred to as a switch, which seems to me to be a more accurate name: as Owen Hughes mentioned, they commonly activate/deactivate something in the UI (i.e. on/off), rather than acting as a way of choosing between two arbitrary values. Think of a physical light switch: it turns a light on/off, rather than alternating the colour of the light between red and blue. For a long list of options go with Select box, else use Radio button. Toggle/Switch is not suitable for this. Like if you ask gender, keep it Radio button. But if you are asking City, then you have to go with Select box. Not the answer you're looking for? Browse other questions tagged website-design selection best-practice or ask your own question. “Responsively” select an item from a large closed collection?